VeriCite DocumentationUser GuidesVeriCite Help VeriCite LTI Instructor HelpHow do I manage role permissions in VeriCite LTI? From the Setup menu, select Permissions. Zoom: From the Setup menu, select Permissions. 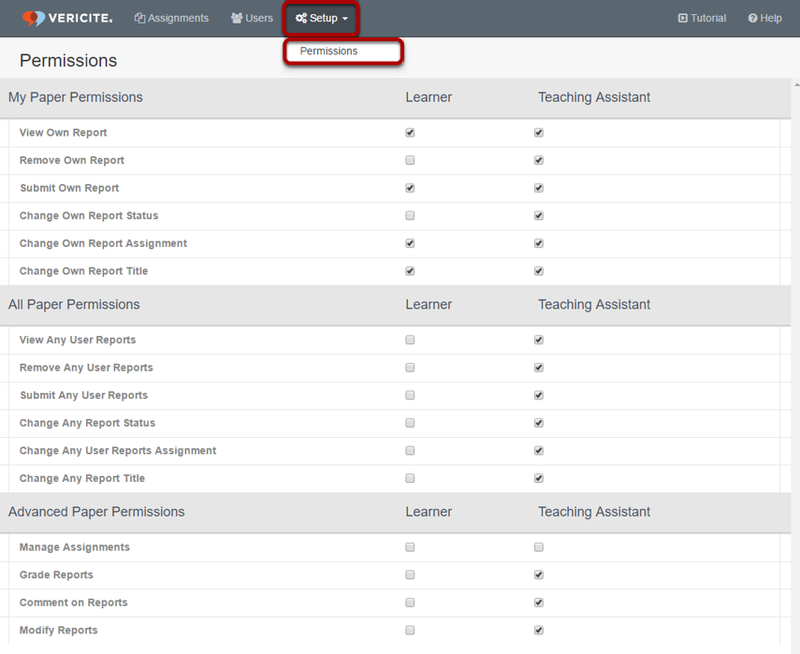 From the Setup tab you can view and modify the Permissions for learners and teaching assistants in VeriCite. Check the box to enable a permission, or un-check a box to remove that permission. For example, if you do not want students to view their own reports, remove the check mark next to View Own Report in the Learner column. Prev: How do I add a VeriCite LTI assignment? Next: How do I edit a VeriCite LTI assignment? How do I configure VeriCite as an LTI tool?